Demonetisation was like cyclone Ockhi for the economy, said the Kerala Finance Minister. 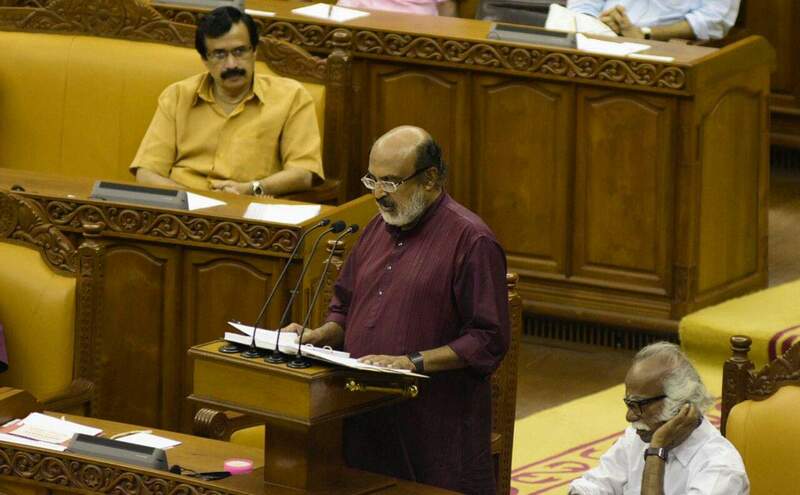 In the Kerala Budget 2018-19 presented on Friday, Finance Minister Dr. TM Thomas Isaac announced higher funding for a number of welfare schemes which would benefit weaker sections. These include special packages for those affected by cyclone Ockhi, and a major thrust to provide housing to all. Isaac also criticised the central government’s policies which adversely affected the economy and the state’s revenues. The LIFE mission which aims to provide housing to all has been allotted Rs. 2500 crore. The mission intends to provide, in 2018-19, houses to 1.76 lakh people who own land, but who do not own houses. The objective is to provide houses which would cost Rs. 4 lakh each. All the destitute families who do not figure in the list because they don't have ration cards would be included in the list. For those who are landless, common land would be found and apartment complexes would be built for them. The flats would cost up to Rs. 10 lakh each. These complexes would also include public facilities such as anganwadis and skill development centres. Rs. 2000 crore package for the coastal regions ravaged by cyclone Ockhi. Disaster management systems and systems to warn those who are engaged in fishing and those in the fishing villages in time. The Disaster Management Authority has formulated a satellite information dissemination system linking fishing vessels and coastal villages for this purpose. This Rs. 100 crore scheme would be implemented in this financial year. There would be free Wi-Fi in every public centre in the coastal villages. "There is need for relocating all the families living within 50 metres of the coast and plant mangroves and trees. A scheme to provide Rs. 10 lakh to every family which agrees to this had been announced in the previous budget. Rs. 150 crore is being allocated for the scheme this year," said the Minister in the speech. Fish markets and fish landing centres are to be developed. Rs. 240 crore has been allotted for the fisheries sector as part of the annual plan, and Rs. 238 crore has been allotted for development of the coastal region. The total allocation for the coastal region, including the outlay for coastal roads, is Rs. 600 crore. The Hunger-Free Kerala scheme which has been implemented on a pilot basis in Alappuzha will be implemented state-wide. Rice and groceries are to be made available at low prices through this scheme, which aims to ensure within three years that nobody in Kerala would have to face starvation. The Good Food Programme aims to make Kerala self-sufficient in the production of vegetables and milk, and to significantly raise the production of chicken and eggs. Poultry farms are to be started under the aegis of Kudumbashree in every panchayat. The outlay for the Scheduled Castes Sub-Plan has been raised from Rs. 2599 crore to Rs. 2859 crore. This is 9.8 per cent of the total plan size. The allocation for the Scheduled Tribes Sub-Plan is Rs. 826 crore, up from Rs. 751 crore in the previous year. The outlay is 2.83 per cent of the total plan. SCs constitute 9.1 per cent and STs constitute 1.45 per cent of the Kerala population. Thus the proportion of the total plan expenditure earmarked for SCs and STs is higher than their proportion in the population. This stands in contrast with the allocation for SCs and STs in the central budget which has been significantly lower than their share in the population. In 2016-17, for instance, the centre's fund allocation for SCs and STs, who together constitute 25.2 per cent of the Indian population, was 11.5 per cent of the total plan expenditure. The highest amount within the Special Component Plan (SCP, for SCs) and the Tribal Sub-Plan (TSP, for STs) have been allotted for housing - Rs. 651 crore and Rs. 236 crore respectively. Rs. 225 crore in SCP and Rs. 55 crore in TSP have been earmarked to enable landless persons to buy their own land. Rs. 464 crore in SCP and Rs. 119 crore in TSP have been allocated for education. Ninety per cent of the SCP outlay for education is in teh form of financial assistance to students. The TSP outlay includes funding for financial assistance, and the funding for model residential schools and hostels. To address the relatively high dropout rates among SC/ST students in higher education, the government has announced a special scheme to provide remedial courses and special assistance to prepare students for exams. The financial assistance to SC/ST students has been increased by 25 per cent. Rs. 289 crore has been allotted for schemes for the disabled. Special schools for the disabled have been provided special assistance of Rs. 40 crore, up from Rs. 13 crore in the previous year. BUDS schools for the mentally challenged would be started in 200 more panchayats. The Minister came down heavily on the central government’s demonetisation exercise during the presentation of the budget. "The currency ban was like the cyclone Ockhi for the Indian economy. There was just one difference - the cyclone was a natural disaster while demonetisation was a man-made disaster,” Isaac said. That the GST collection has been below expectations has been a setback for states like Kerala, said the Minister. There is large-scale leakage as far as IGST is concerned. As the check-posts on the inter-state borders ceased to exist with the advent of GST, commodities are flowing into Kerala without bills. The Kerala government tried to restore the e-declaration system which existed earlier to check this. But the High Court ruled that the GST council's notification is required for taking such measures regarding IGST. Although Kerala strongly raised the issue in the GST council many times, no notification was issued due to the central government's stand that separate notification need not be issued for a few states. "This experience shows the loss of taxing power of the state government as a result of the GST. States cannot change tax rates or make changes in tax governance rules. Much of these powers were already lost when VAT was implemented. Now these have been taken away formally by means of a constitutional amendment," said Isaac. The state's tax revenue has increased only by 5.2 per cent in comparison with the 16.08 per cent projected in the previous budget. Central assistance also increased only 25.15 per cent until November. The total revenues of the state increased only by 7.7 per cent. But plan expenditure increased by 22 per cent and non-plan expenditure by 21 per cent. The Kerala Infrastructure Investment Fund Board (KIIFB), created by the LDF government as a Special Purpose Vehicle for mobilising and channelling the funds to various infrastructure projects, has been key to the funding of many projects announced by the government. The previous budget had put forward proposals worth Rs. 54,000 crore. Out of this, KIIFB has provided funding of Rs. 20,000 crore worth of projects and they are moving towards implementation. Another Rs. 10,000 crore is going to be granted soon, and the rest in 2018-19, said the Minister. This level of investment is unprecedented, and the stimulus it provides would be an antidote to the economic slowdown. The Kerala economy grew by 7.41 per cent in 2016-17, which is higher than the all-India growth rate of 7.1 per cent.